Brightech Company is definitely someone you want to deal with. Different reasons for that but we will mention them later in our review. They offer various types of products and one of categories that is especially interesting for us and of course it is their jump starters. One of the most popular product on market and a great jump starter is the one we are going to present you in our review. This multi function jump starter called simply SCORPION offers you various options of use. So, not only you will get powerful mini jump starter reaching boost energy up to 400 Amps but also a great power bank of 10.000 mAh. This great combination packed inside of this pocket size device definitely attracts attention. 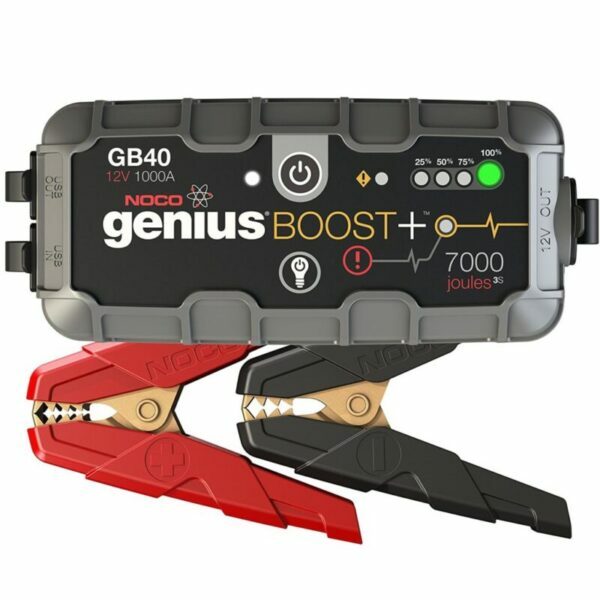 Main reason of our interest about this jump starter is related with the fact that Brightech Company offers great customer care and great 3-year satisfaction guarantee! These quality features makes this product one of the best on market. Small enough to fit your pocket but powerful enough to jump start a car. This is basically a sentence which could explain this device but our review will give you detailed insight of many other options this mini jump starter can provide. 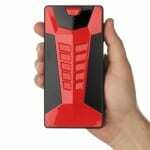 2 Brightech SCORPION – powerful jump starter! With all this equipment almost any electronic device can be recharged. Used as power bank or in emergency jump starts this small device offers best possible support. 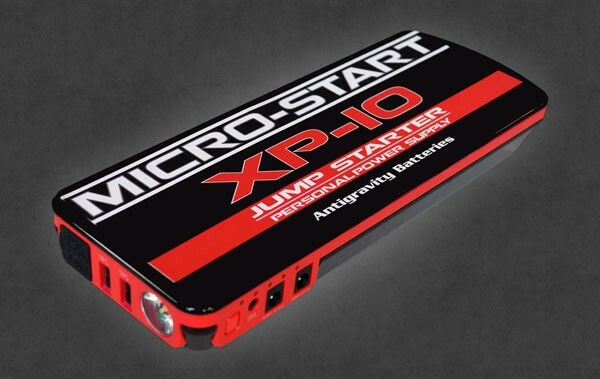 Together with Micro Start XP-10 and XP-1 SCORPION has one of the best equipment in this category of jump starters. Unit itself is a size of a Smartphone so it easily fits your hand. 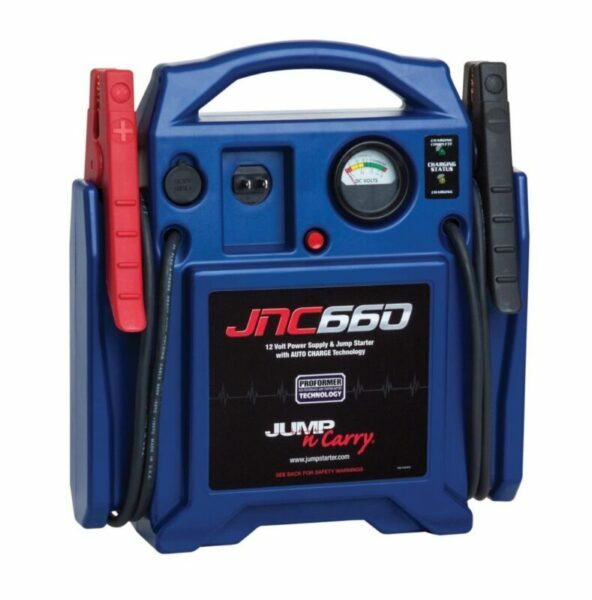 It is very portable and definitely can be called pocket jump starter. 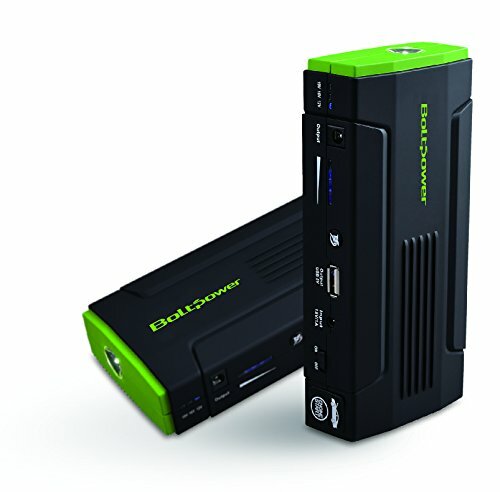 Really beautiful ergonomic design makes this mini jump starter recognizable and one of the smallest in category. Design is really beautiful and black and white housing is made of shiny hard plastic. On the front side there is very bright flashlight and several ports. This flash light is very useful especially in emergency situations as it has three modes, SOS strobe, emergency strobe and solid light. Besides flashlight there are also two 5V USB inputs which can be used to simultaneous charge devices who use this kind of voltage e.g. Smartphone’s. 19V output is also on the front side. This kind of output is used to connect larger devices such as Laptops. 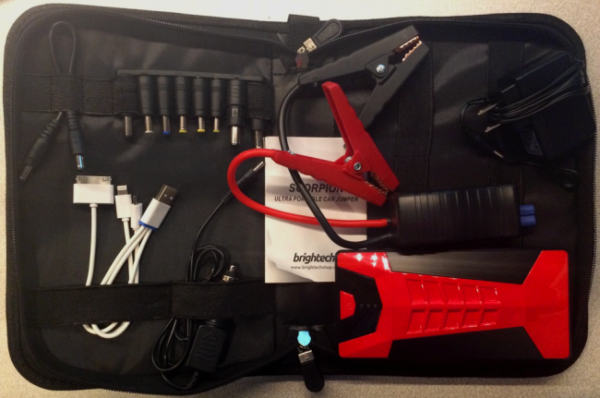 Note that Brightech SCORPION portable jump starter can’t be used to recharge Apple Laptops. However, this great combination of most useful ports will definitely cover most of electronics you use today. Battery indicator is located on the face of this mini jump starter. Actually we didn’t like it because it has only three LED lamps so it is not as precise as it should be. It is not a big deal of course but just a thing to notice although they look very nice. We liked it can be purchased in four different colors (red, orange, blue, green) so if you are a fashionista you have an option to chose one for yourself. Brightech SCORPION – powerful jump starter! 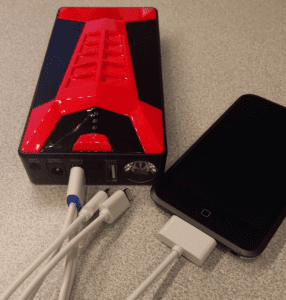 This portable jump starter and a power bank is actually a Lithium-ion battery. 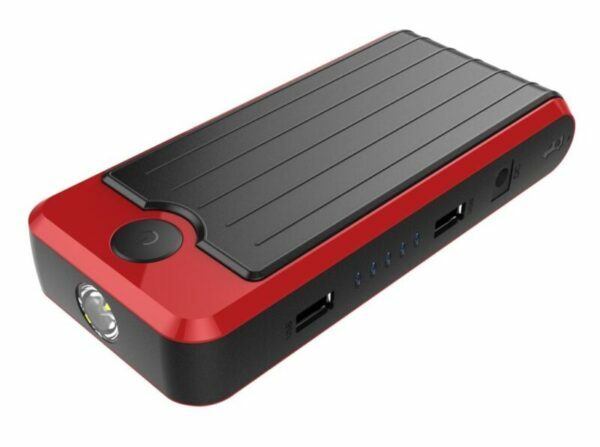 It is a multi functional device containing 10.000 mAh and reaching up to 400 peak Amps. Quality and miscellaneous equipment make this package very useful in emergency and everyday situations. Manufacturer climes this device can jump-start even trucks and up to V8 engines. Really impressive for this tiny jump starter as we have used these massive jump starters for that kind of engines. But for the purpose of this review it has been tested as jump starter and a power bank in order to get most of this great little device. As in our previous review of NOCO GB30 we tested it on 3.5L V6 Toyota Highlander. It is not powerful V8 but again strong enough to see if SCORPION works. Before even trying to jump-start a car be sure you read user guide provided with this device. Although you may already have experience and know how jump starting a car we highly recommend you to read it because it may be some differences between jump starters. We say this from our personal experiences. Second thing to notice is a little bit silly but be sure you have a drained battery problem. The fact is that most of complaints about mini jump starters come from those who don’t know how to use a device (although it is very simple). So after reading users guide, we connected mini jumper clamps to the unit. We didn’t need to recharge device as it came almost fully charged. There is a green LED lamp on clamps indicating that everything is ready and we can go try to start the engine. NOTE: if you hear clicking while cables are connected it means you need to start the ignition so don’t worry about that. We finally started the ignition and Voila! It worked like a charm! Started our V6 engine with such an ease we were impressed. Be sure you disconnect clamps as soon as you start the engine because alternator will drain power from the unit. Think to notice is that SCORPION stayed fully charged and ready for another 15 to 20 tries. But we didn’t go so far as we tried a jump start few more times and like the first time, it did the perfect job. As we mentioned earlier Brightech SCORPION is a multi-function device what and besides jump starter it is also a power bank with 10.000 milliamps of capacity. So, having it in your backpack or a purse as you go for a trip or anywhere where you don’t have a power source is definitely a great choice. We used some of many different detachable tips you get within the case for charging a couple of smartphones and it worked just fine (Note: want work for new iPhones as it comes with 30-pin variety). As it has two USB inputs it is possible to simultaneously recharge two devices in the same time. When fully charged battery can stand for up to six months. So be careful and not forget to recharge it. It easy to do it as it has mobile charger who uses cigarette lighter place in a car as a power source. Make sure you have it fully charged to be able to solve every emergency situation. This mini jump starter is fully safe and easy to use. Built on advanced technology such as Spark-Proof technology and Reverse Polarity prevents any kind of possible unwanted situations to happen. Either if you are professional or an amateur SCORPION jump starter will be completely safe to use and you don’t have to worry if you accidentally touch clamps or connect them on a wrong way. Also a thing to notice is that you can leave this device on a charger and not worry about over-charging. So, as we tested it during this review we can confirm that SCORPION portable power supply from Brightech is perfectly safe to use and ready to meet all your expectations. For any kind of questions you have this Brightech company will answer very fast and with all necessary details. Our final words at the end of this review are definitely words of praise. 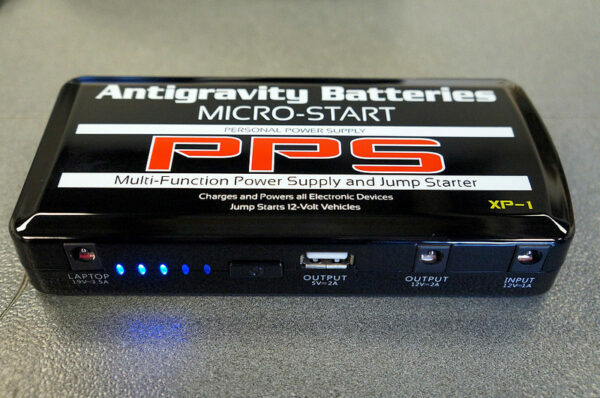 Not only it did jump start our vehicle and recharged several electronics during the test this portable jump starter has the best customer support on market! These guys from Brightech are great. They stand fully behind this product and with 3-year satisfaction guarantee, you will be completely sure you are purchasing a good stuff. However, we will have to say something we didn’t like and that is battery capacity of 10.000 mAh. For example, PBJS12000R has 12.000 mAh and nearly the same other characteristics but again not so good quality. So it is up to you and your needs. Make sure you have SCORPION fully charged in your trunk or under your motorcycle seat when you go for a road trip and don’t worry about battery problems. It is very useful in cold areas where this problem is more usual. Think to notice is that there are some similarly designed products on the marker so be careful not to be cheated and pick Brightech. SCORPION definitely takes very high place on our list of best portable jump starters because of his fantastic performances, quality and remarkable customer support coming from Brightech company.